Hugh Masekela, whose middle name is "Romopolo", was born on April 4, 1939, in Kwa-Guqa Township, Witbank, South Africa. He became a cornetist, composer, and singer. He is the father of American television host Sal Masekela. He is known for his jazz compositions, as well as for writing well-known anti-apartheid songs such as "Soweto Blues " and "Bring Him Back Home ". Hugh Masekela was a trumpeter in the first South African band that was created in the early 1960s. This was the first ever complete band of black musicians to make a record. That recording took place less than Coltrane's Africa. Dollar's Moods and Carol's Drive, two pieces from that early album was only re-released for the first time as a CD as recently as 1999.
declared illegal. We had to break up the band. We were only three months old as a band, and we were about to undertake our first national tour. All the shows were sold out, but it never happened. It was a great disappointment for us". 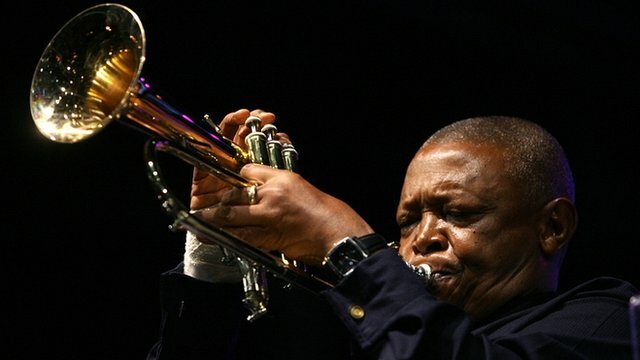 Beginning around 1954, Masekela has played music that reflected the pain, rage, and exploitation South Africa faced during the 1950s and 1960s. It inspired and influenced him to make music and also spread political change. He was an artist who in his music vividly portrayed the struggles and sorrows, as well as the joys and passions of his country. His music protested about apartheid, slavery, government; the hardships individuals were living. Masekela reached a large population that also felt oppressed due to the country's situation. 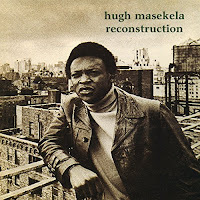 Hugh Masekela wound up in the orchestra of the musical King Kong , written by Todd Matshikiza. King Kong was South Africa's first blockbuster theatrical success, touring the country for a sold-out year with Miriam Makeba and the Manhattan Brothers' Nathan Mdledle, in the lead. The musical later went to London's West End for two years. Hugh Masekela left South Africa in 1961 and moved to the United States, where he made a considerable reputation over the next ten years or so, playing his blend of bop and South African township music. He had tremendous success in the United States with the pop-jazz tunes "Up, Up and Away" (1967) the piece,"Grazing in the Grass" (1968), performed by the group, "Fifth Dimension ", which sold four million copies. In 1967 Hugh Masekela appeared at the Monterey Pop Festival. Masekela and friend Stewart Levine organized the Zaire 74 music festival in Kinshasa set around the Rumble in the Jungle boxing match fought by Muhammad Ali and World Heavyweight Champion, George Forman, that took place in Kinshasa, Zaire (now the Democratic Republic of the Congo). Hugh Masekela remains true to his roots. He is involved in several social initiatives and serves for instance as a director on the board of the Lunchbox Fund, a non-profit organization that provides a daily meal to students of township schools in Soweto.